“As a teenager, music became my outlet for self-expression. My love of music is a gift from my father. Asian parents in North America are generally portrayed as strict and disciplinary. There is a stereotype that they would never encourage their children to pursue a career in the arts, but instead pressure their kids to go in medicine, law, or accounting. My dad was the complete opposite. He had a wonderful vinyl and CD collection at home that I spent hours exploring as a kid. He would always play music at parties and family gatherings, and dance to his favourite songs. He showed me that music is fun and full of life. I studied Jazz and Contemporary Music at Humber College. Music is my life, and I am a proud member of Canada’s music scene. I think I may be the first Asian Canadian woman to take home a Juno Award in the Jazz category. I am grateful to live in a country that provides robust support for the arts. 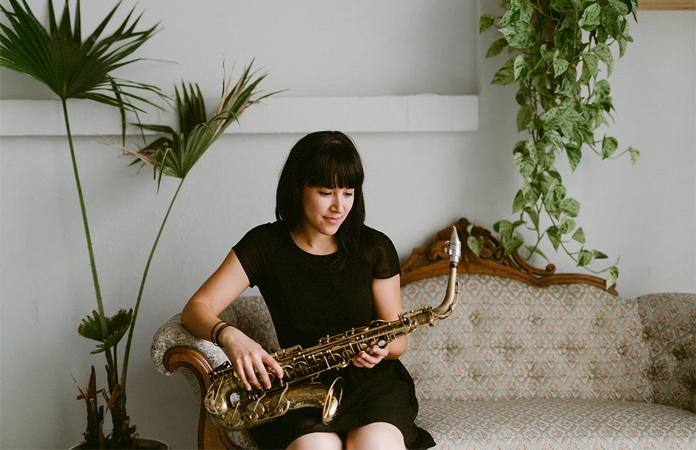 Canada has offered a rich environment for me to explore my identity through music and in the company of a vibrant community of diverse Canadians.” And she signs off her essay with #proudlyasiancanadian #asianheritagemonth. Both the hashtags suggest that Miss Au knows exactly where she is coming from and her music is a powerful sign that she also knows where she is going too. Right now she may be reveling in her masterly skills in writing for the “conventional quartet”, as she calls it. But she seems to be “hearing” a different kind of radiant sound, something that is shaping into music that also includes the tintinnabulation of the vibraphone; something that is prompting the use of a synthesizer, which Todd Pentney will explore on the new music, which is likely to add a more choral and full-bodied tone to the music of the piano. Add to that the fact that with the burnished tone of her alto saxophone, Miss Au will continue to bring her singular luminosity to the music, while projecting its authority in a mellifluous manner and you can already imagine what’s coming round the mountain: an experience that will resound in a fine blend of vigour and sensitivity, revealing all of the notable ingenuity of Allison Au a distinctive voice in the music of Jazz.